I am sure that you all will agree that Lipsticks are in complete without there partners, "LIP Pencils". 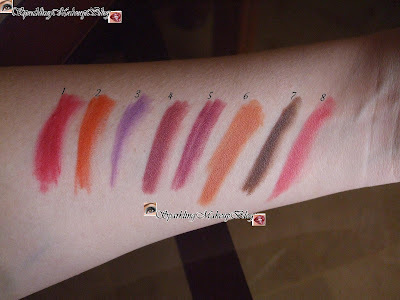 Therefor I thought my blog series My Lipstick Collection will be incomplete without showing you all my Lip pencils collection so are you excited, the way I am? To KNOW more, READ more!!! I use Lip liner pencils but when I am just going out, I skip it and just put on my Lipsticks, and here I go! On the occasions when I am really getting ready and following all make-up rituals than its a must to define my lips and enhance there shape and some times the shade of the Lipstick. I do not fill in all the lips, usually, Just outline them, not a prominent one(I choose the lip liner color that settles with the applied lipstick shade), and may blend the lips liner color with the lipstick if required. Personally I do not like Thick Prominent Lip outline that stands out, that only suites on Big Lips, and I don't have those. I also use these to control the gloss with in the limits of my lips...lolz. 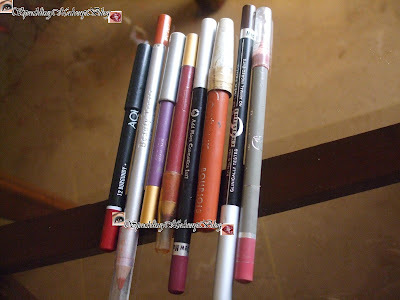 I remember that there was a time in my student life when I was not able to buy many lipsticks so I used some of my in-expensive Lip pencils and mixed them with my available Lipsticks to create different Lipstick shades, unique and my own, usually I mixed with it a bare lipstick I had named "oatmeal" from Jacqueline company. Lets Have a look at the pencils and the swatches without wasting any time: HAVE A LOOK!!! It is BURGUNDY #12 shade from Aqua Germany, I bought it on my wedding as I needed a liner to outline my Red Lipstick, Review. So it is a dark and more on the RED side, see I did not want a common red. So I use it with my Bright Lipsticks. It is also for eyes but I never used it on my eyes. It is a soft orange or you can call it a dark coral, I apply it with my coral and peachy shade Lipsticks like my Classics #211, Review, or my Golden Rose Lip-gloss in #103, Review. It is from Beauty Treats #BC001. This I also bought on my wedding. It is a mauve pencil mostly used with my pinks to add a mauve-ish shade to them depending on my dressing. I often use it with my Classics Diamond shine Lipstick #53, Review. I bought it for Pkr 10 only and the brand name has disappeared,may be its from Davis? The number is 026. This is another brighty, DEW MAUVE 250 from Christine. It is a mauve-ish Maroon. Again used with my bright Lipsticks and also to brighten up my pinks some times.This I also bought on my wedding. Used in a Makeup Look HERE!!! This is a pale peachy coral from Bourjois Paris,number has disappeared. It is a Jumbo pencil. Few years back it was in fashion to put these lip pencils alone on lips,now I use it as a base for my Lip gloss. This is MOCCA 280, from Christine. As it is brown so it mostly goes with my brownies, I mean Brown Lipsticks.This I also bought on my wedding. Used in a Makeup Look here. This is a soft PINK, PURE PINK, from Beauty Treats #BC009 I like this shade alot as it is so soft that it just provide outline to my pink lipsticks and glosses and does not stand out. This I also bought on my wedding. This Product is used in a FOTD here. Hope You Like my Lip Liners collection. Do comment, share, like, tweet and G+ this post. 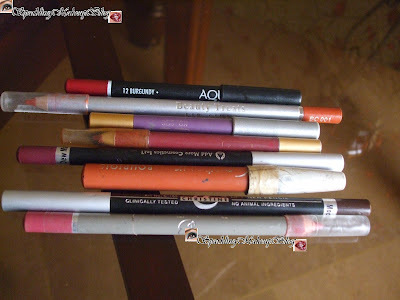 Do You use Lip Lining Pencils or just skip this part? i use lip pencil religiously .i have fuller lips and i am conscious that light colors might make them look big so lip pencil is a must.i also use jumbo pencil and lip pencils to create the shades i like,just like u ^_^. I really like your blog series and enjoyed it as much as anyone could without pics(internet probs arghhh). nice review its hard to find a good creamy lipliner. salam can u tell me where i can get the Beauty Treats #BC001 lip pencil in Karachi?? hi can u plz let me knw where can i get Davis lip liner...any online shoppin sites to buy it? ?